LANGE RS130 FIS 43mm SKI BOOT 26-26.5 MONDO. I HAVE MADE THE SKI BOOT 120 FLEX BY TWO ALTERATIONS ON THE UPPER SHELL AND THE FLEX AREA-ALL PROFESSIONALLY DONE. Lange Concept 65 ski boots 28.5. My feet are size 9 and they fit me perfectly although ebay suggests 28.5 is equivalent to UK size 10. They have had little use and are in good condition with just some minor blemishes. The flex is adjustable. Collection only please from near Burford in Oxfordshire or my office in Hungerford. I may be able to deliver them to somewhere along the HS2 route from Buckinghamshire to Warwickshire. Please see my other items - I have two pairs of skis and poles, both set up for these boots. Used ladies ski boots in good condition, small scuffs on the sole but otherwise good condition. If there are any questions, please let me know. 80 flex index. The logos are clean and unscratched. 276 mm sole length. Very good condition - have probably seen little use. Lange race boots size UK 6/6.5. Used but in good condition. Anatomic fit. Ladies ski boots from Lange. - Purple outer with yellow details. - UK size 6. Lange Freeride ski boots. Size 9 UK, 44 EUR, Mondo 28. These have been used and have scuff marks to most parts of the boots. Used but in good condition Lange ski boots size 7 --7.5 in a lovely electric blue colour,very expensive ,bargain !!!! Ski Boots Allmountain LANGE RX 100 WHITE Size 28.5. Used for one week only, very good condition. Box included. These have been used and just not used therefor need to be gone. Taking up wardbrobe space. They say size 10 on the base. Have been used. All latches are functioning. Off white and blue ladies ski boots. These are in good used condition; could easily have liners replaced but they have plenty of life in them as they are. Collection preferable from Windsor. Excellent used condition in box. Lange Ski Boots GX8. Size US 8.0 / 41 / UK 7.5. Colour Red. New / Boxed. Unisex ski boot. Flex at 70. Boot Sole length 279, Mondo size 23.5, Flex 95, Last/width 103mm. Lange Vector 7 ski boots in navy blue. Size 10 UK, 44.5 EUR, Mondo 285. These have been used and have scuff marks to most parts of the boots. Ski boots Lange SX 120 size 25.5 - barely used with brand new liners. Ski boots Lange SX120 size 25.5 With the boots has been skied just a few times. Liners have never been used. Get the best fit by following: 1. Heat the liners in oven for 5 minuets and temperature 80 degrees. 2. After that put the liners straight away in the ski boots shells, put your foot in the ski boots (with some toe caps on if possible) and buckle them for 10 minuets. PLEASE NOTE: This exact model is currently in stock and if you purchase through this listing this will be the pair which will be sent to you. If the liners have been heat molded or the skii boots have been used the 14 days money back guarantee does not apply. Lange RX100 W ladies ski boots NIB. Size 24.5 Fits UK size 5. Very comfortable! Brand new with tags in original box are these Lange RX100W Ladies Ski Boots, size 24.5 which equates to around a UK 5 - 5 1/2. I bought two pairs of these boots originally thinking I might wear out my other pair but they are still going strong so I’m selling this brand new pair to help fund some more skis! Extremely comfortable, and in a gorgeous colour combination of magenta purple and white, they will not only perform fantastically on the piste but will look amazing as well. The boots are as new and are ready to be tailored to your foot shape by taking to your local ski and boot shop and getting them professionally fitted. These are the most comfortable boots I have ever worn and I’ve been skiing over 20 years. Hardly worn stiff ski boot for advanced skier. In good condition. Only scuff marks on the outer shell. All clips working. Straps in good condition. ERGONOMID CONCEPT. LANGE ANTHEA MID ski boots. Size UK 7 / Mon 25 / EU 41. Everything in good order and functioning correctly. LANGE WORLD CUP 100 TEAM SKI BOOTS. SIZE LABEL ON BACK OF BOOTS READS 6,5 - 37.5 WOMAN/JR. THESE ARE UK 4.5 - 5. Ski boots Lange XT 130 size 26.5 - barely used with brand new liners. Ski boots Lange XT 130 size 26.5 with dynafit pin binding system With the boots has been skied just a few times. Liners have never been used. Get the best fit by following: 1. Heat the liners in oven for 5 minuets and temperature 80 degrees. 2. After that put the liners straight away in the ski boots shells, put your foot in the ski boots (with some toe caps on if possible) and buckle them for 10 minuets. PLEASE NOTE: This exact model is currently in stock and if you purchase through this listing this will be the pair which will be sent to you. If the liners have been heat molded or the skii boots have been used the 14 days money back guarantee does not apply. Keep your boots warm and dry during the drive to resort with this heavy duty heated boot bag from Lange. 600D Polyester and PVC material ensure that the bag will be able to withstand a beating. Ski bindings. You are viewing a Pair Of Ladies LANGE The Mid 4.8 Lady Ski Boots. There is various marks around the boots (as seen in the photos). The interior of the boots looks to be in reasonable condition. The sizing is 26.5. Ladies Lange Ski Boots Size UK6,5 EU39,5. Condition is Used. Dispatched with Other Courier 3 days. My wife has now decided skiing is just not for here, as she has now sold her skis. 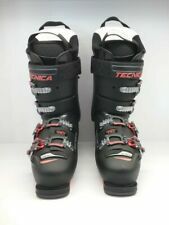 lange ski boots rsj 60 Size 21.
lange ski boots rsj 60 Size 21.. Condition is Used. Dispatched with Royal Mail 2nd Class. Lange’s new XT boots are the first, no-compromise high-performance boots that climb. The unique new, patented Power V-Lock provides excellent climbing range-of-motion. But, unlike all other AT and “sidecountry” boots, XTs feature a structurally superior, performance lower shell.